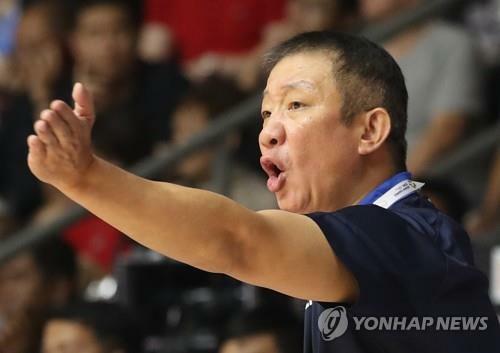 SEOUL, Sept. 5 (Yonhap) — South Korean men’s national basketball head coach Hur Jae resigned Wednesday following a third-place finish at the Asian Games. The Korea Basketball Association (KBA) said it accepted Hur’s intent to quit just four days after South Korea defeated Chinese Taipei in the bronze medal game at the 18th Asiad in Jakarta. South Korea captured gold at the 2014 Asian Games but lost to Iran 80-68 in the semifinals this year. The KBA added Hur’s former assistant, Kim Sang-sik, will serve as the interim head coach when South Korea plays Asian qualifying matches for the 2019 FIBA Basketball World Cup on Sept. 13 and 17. The KBA said it will begin searching for a full-time replacement for Hur after Sept. 17. Hur, widely regarded as South Korea’s greatest player ever, took over the national team in June 2016. His term was to expire in February next year. On his watch, South Korea finished third at the 2017 FIBA Asia Cup and made it through the first round of the World Cup qualification earlier this year. But Hur came under fire for selecting both of his sons, Heo Ung and Heo Hoon, for the Asian Games squad. Heo Hoon, a 180-centimeter point guard, was the first overall selection in the Korean Basketball League (KBL) last year and led all rookies in assists per game. But the KBA had pushed for a taller post player when Hur insisted on picking his younger son. Both of the coach’s sons had limited impact on the team. Heo Hoon didn’t play in South Korea’s semifinal loss to Iran. For the upcoming World Cup qualifying games, Heo Ung and Heo Hoon have both been left off in favor of An Young-jun and Yang Hong-seok, who combined for the silver medal in the men’s 3-on-3 basketball in Jakarta.